When I was growing up, I always had a fascination with how things were made. I really loved special effects in movies, and I always obsessed over trying to figure out how they created them. I especially loved those behind the scenes featurettes, which gave an insight into how the final, polished product came to be. It made the impossible seem possible, and it gave me a new perspective and appreciation for the things I loved. This curiosity has no doubt built the foundation of my own passion for creating. Design can be a mysterious thing. 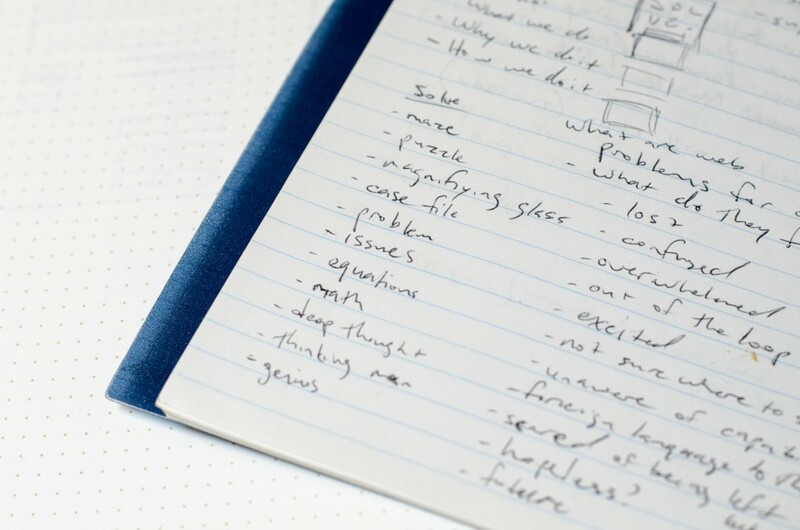 We all love good design, but few people understand the underlying process. With that in mind, I’d like to share with you a behind the scenes look at how we created our new logo. It was bold, it did it’s job, but that was about it. As we started to grow in our skills and creativity, we began realizing the importance and impact of a well constructed, thoughtful logo design. There are essentially 7-ish major steps to a successful logo design, and everyone’s process is slightly different. Since we were designing our own logo, this process varied slightly, but the principles stayed the same: a thoughtful, systematic approach. We begin any logo design process with a client interview and discovery. In order to craft a logo that speaks to the values and personality of the company, it’s important to understand what those qualities are through proper research. Even though this was our own logo, we didn’t skip this important step. Instead, we asked ourselves a few questions. What do we do? Why do we do it? What are our values as a company? What type of personality does our company have? Who are our customers? From these questions, we determined that we are a design focused, strategy driven company that solves real problems for our clients. Our values include professionalism, detail, transparency, and a passion to help others through everything we do. We also wanted our personalities to be part of our brand. And we determined that our customers are small businesses that understand the value and power of good design. We documented all of this in a simple word document, and printed it out so it was top of mind during the process. In addition to researching our own company, we researched our direct and future competition, logo design throughout history, design trends, and also our target market. This helped us gain perspective, as well as get the juices flowing with potential ideas for the logo. Once we had a solid understanding of the personality and values that we wanted to convey through our logo, we began exploring the concept. First, I took a notebook and did some free association writing. For example, solve makes me think of puzzles, games, solutions, mazes, Wheel of Fortune, detectives, light bulbs, a-ha moments, riddles, etc. We then threw some of those ideas against the services we provided to see if there was a connection. 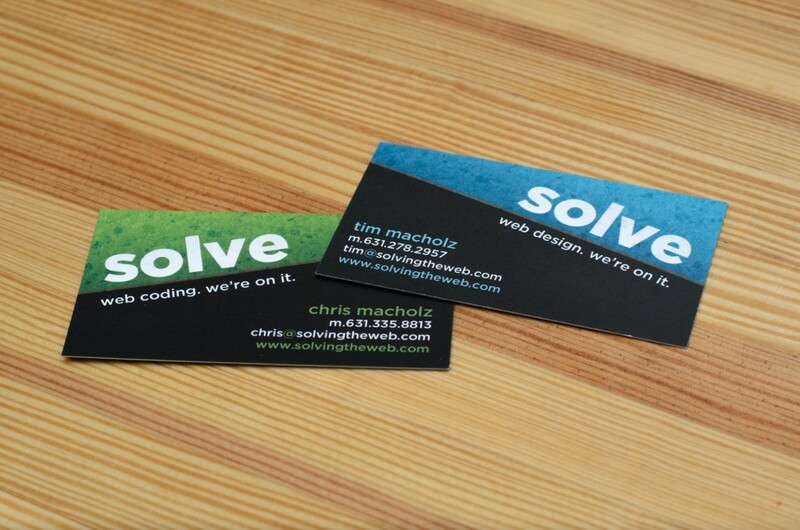 We really liked the idea of the web being a puzzle or riddle that we could solve for our clients. We also liked the sleuth/detective idea, and even more so the idea that we were these private detectives that solved web design cases. We had a few interesting concepts to work with, so it was time to start sketching out some ideas. 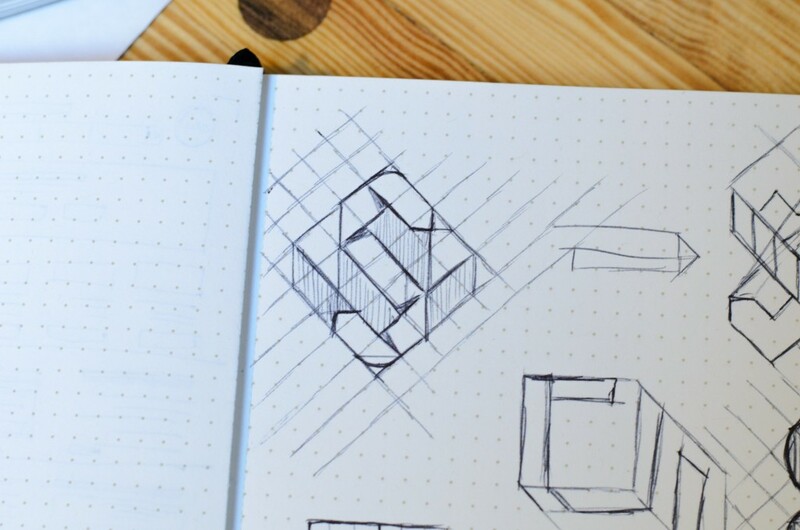 When it came time to start sketching concepts, we started translating those concepts & ideas to icons and typography styles in the form of hand drawn sketches. For the puzzle/game idea, a puzzle piece could represent a puzzle, a maze icon could convey feeling lost, a Rubik’s cube is a common object that translates to complex puzzles, a question mark for riddles, and so on. For the detective concept, we thought about magnifying glasses, light bulbs, a detectives badge or hat, and even broader concepts like making our brand and site feel like it’s out of a 1920’s private detective ad in a newspaper. A lot of those ideas seemed a bit cliche, but it’s only when you exhaust your ideas that the best ones have room to grow. After reflecting on the sketches, a few solid ideas came through. We really liked the idea of a Rubik’s cube, a maze, and math equations. So we began to explore that a bit more through more sketching. Maybe we could create the letters S and D within the Rubik’s cube grid? Sketch that. Maybe there’s a grid-style maze, and the letters are created within a maze path? Sketch that too. Maybe we could create an S where the two curves are split by an equal sign? Worth trying. The key is that there are no wrong ideas here. Sometimes you have to dumpster dive to find buried treasure. Once we had a solid idea, we moved into Illustrator to refine. Since we had the initial sketches, it was fairly easy to start bringing life to the idea. My first attempt was straight forward, using a 3×3 grid for each side of the cube, and creating thicker lines inside to create the letters within the cube. However, the letters didn’t seem to be popping enough, and it felt a bit flat, so I added a bit of shadow to the block to add some interesting dynamics and bring out the letters a bit more. I also added some color to get a better sense of where this could go. Better, but still not quite right. Still felt flat, and the silhouette wasn’t very strong. So I thought that maybe it needed to show some motion. Maybe the cube should be in the process of shifting? I didn’t want to lose the letter shapes if I turned one of the rows of blocks (Rubik’s cube-style), so instead I tried a more abstract approach, something that could trick the eye a bit. It was a solid direction, so we tried some different variations with typography pairings. The logo was headed in the right direction. We liked it. But I have a habit of trying something completely different once I’m happy with a design. Just to see what completely different would look like. And most of the time, that second design turns out even better. After sitting on it for a few days, I kept coming back to the idea of a logo mark that tricks the eye. I’ve always been a fan of math, and fell in love with M.C. Escher’s body of work featuring impossible geometry and explorations of infinity. It fit the math & puzzle concepts we had come up with, so maybe we could create a geometric pattern that could invoke this sense of impossibility and infinity? I researched some more Escher work, and did a few sketches of the S in Solve with the idea of quirky geometry and infinite looping in mind. 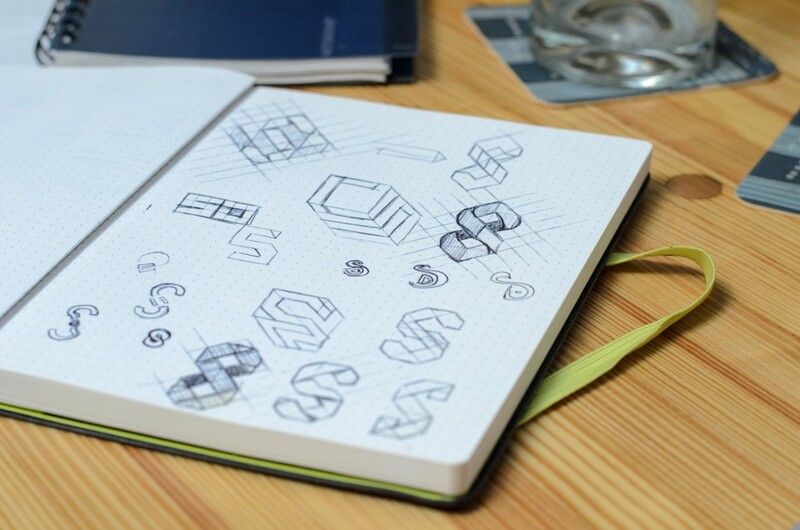 Included in these sketches were the ideas of grid based geometric shapes, dimensional folding origami shapes, and making the S a self-looping infinity sign. I was definitely onto something, albeit crude, so I jumped back into illustrator to fine tune the idea. The main idea that was starting to develop was combining the infinity idea with a mind puzzle; an impossible geometric shape for the S. The result was two boxes sitting on top of each other forming both an infinity sign and an S. I love hard edge shadows, so I added a few to bring out the dimension of the object, but ultimately decided simple is better. Next was typography pairing and color palette. I tried multiple colors, but skewed towards a gradient to keep the shape readable since there’s a lot going on already. I also at one point tried combining the S and the D into the shape, but decided it was too much. When we landed on a final design we were happy with, we stood back and compared the two choices we had made. 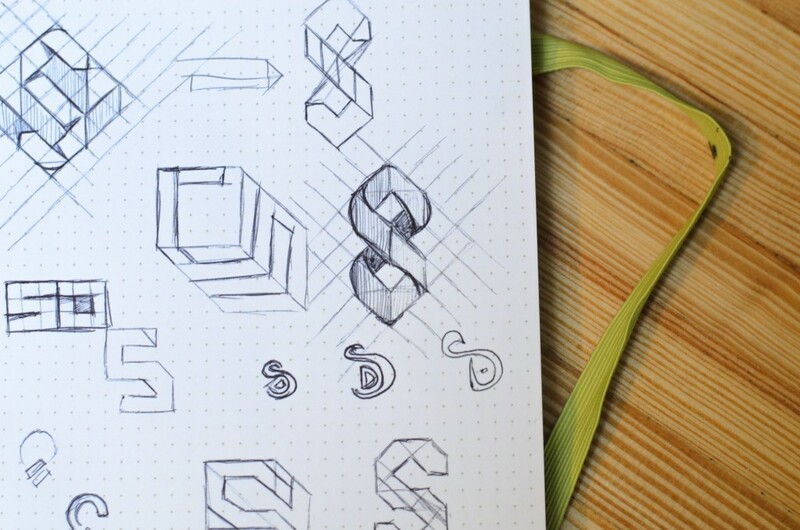 Both had good aspects, but ultimately we felt that the geometric S was more professional, colorful, and conveyed our brand in a way that wasn’t overly cliche. The final product is a well thought, playful, yet professional logo that’s both intriguing and memorable. This was the start of our ongoing branding exercise, and the basis for the look of our new website. And we are extremely proud of it. Whether you’re designing a logo, or hiring someone to create one for you, it’s important to understand the process behind the scenes. If you respect the process, it delivers results. It can be tempting to jump straight into Illustrator, or to skip the discovery process, but research is not an add-on. When you put the effort into doing it right, a logo is more than a generic symbol of your company. It embodies your entire philosophy as a company. I hope you enjoyed reading about our process, and especially hope this can help you craft better, thoughtful work in the future. We’d love to hear about your experience. How do you design logos? If you own a business, what experiences have you had with creating a logo for your company?